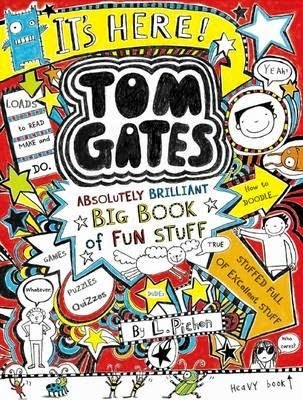 Entering the world of Tom Gates is like stepping into an entertainment arcade. That’s how I felt when I opened this book. It’s everything it claims to be. It’s full of puzzles and quizzes, ridiculous ideas on how to avoid homework, and games. It begins with maps of Tom’s area, an introduction to his friends and school mates, and lots of spaces to doodle in. There’s endless entertainment and great stuff to keep children busy and out of mischief leaving absolute no opportunity for kids to become bored. A double page is dedicated to the Fossils (that’s what he calls his grandparents). Hilarious examples of his sums that never add up, evidence of his attempts at homework, and the results of his daydreaming, end with more doodling. School photos are a hoot and so are pictures of his sister Deliah although most look the same. There is a lot of sharing about his mates and their escapades. The maze is for readers (of all ages) to find their way through, spot the difference, a ‘keep out’ or ‘come in’ sign to cut out and hang on the door, dot-to-dot, and countless activities. The Star Pupil game helps to keep focussed. You can always try Granny Mavis’ Fish Biscuit recipe. If I forgot anything, please forgive me as I had such fun reviewing this book, I kept turning the pages quickly to see what surprise was waiting on the next page, and may have got distracted.